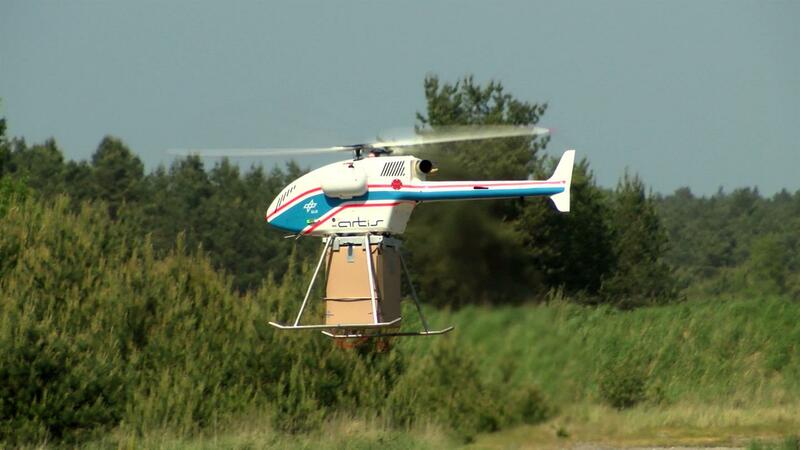 DLR’s unmanned Autonomous Rotorcraft Test bed for Intelligent Systems (superARTIS) helicopter is being used to investigate how relief supplies for hard-to-reach disaster areas can be quickly, cost-effectively and safely delivered. DLR’s unmanned Autonomous Rotorcraft Test bed for Intelligent Systems (superARTIS) helicopter can deliver payloads of between 10 and 20 kilograms. 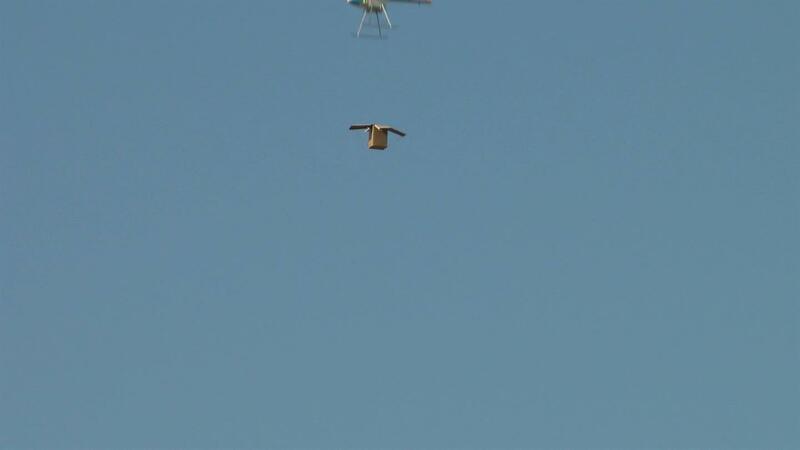 During the drop, the braking flaps of the Wings for Aid cardboard boxes deploy to stabilise its trajectory and decelerate the descent to safely deliver emergency supplies to their destination. Flooding, earthquakes and other natural disasters can isolate people. These people have to be provided with essential humanitarian supplies as quickly as possible. In a new coalition for innovation, the German Aerospace Center (Deutsches Zentrum für Luft- und Raumfahrt; DLR) is cooperating with the Dutch Wings for Aid Foundation and the United Nations World Food Programme (WFP) to develop new assistance scenarios in which Unmanned Aircraft Systems (UAS) are used to deliver the necessary supplies. Until now, crewed aircraft, helicopters and boats have been used to deliver emergency supplies such as blankets, water or food to isolated disaster areas. In many cases, bridging the 'last mile' of the supply chain is a particular challenge. "We want to investigate if we can bridge the last mile cost effectively, quickly and safely using unmanned aircraft in real-life tests," says DLR Project Leader Johann Dauer of the Institute of Flight Systems. The researchers acquired experience in the development and testing of humanitarian technologies in the DLR Automated Low Altitude Air Delivery ALAADy project. This investigates the use of unmanned aircraft for cargo delivery using very low-level airspace. The flights for the project use DLR’s unmanned Autonomous Rotorcraft Test bed for Intelligent Systems (superARTIS) helicopter to deliver cargo to isolated areas. Novel, disposable cardboard boxes from Wings for Aid are used to drop supplies from the air safely, leaving the vital contents undamaged. These boxes are inexpensive to manufacture and biodegradable. They have special aerodynamic surfaces that deploy automatically during the drop and serve to both limit the descent speed and stabilise the box’s trajectory. 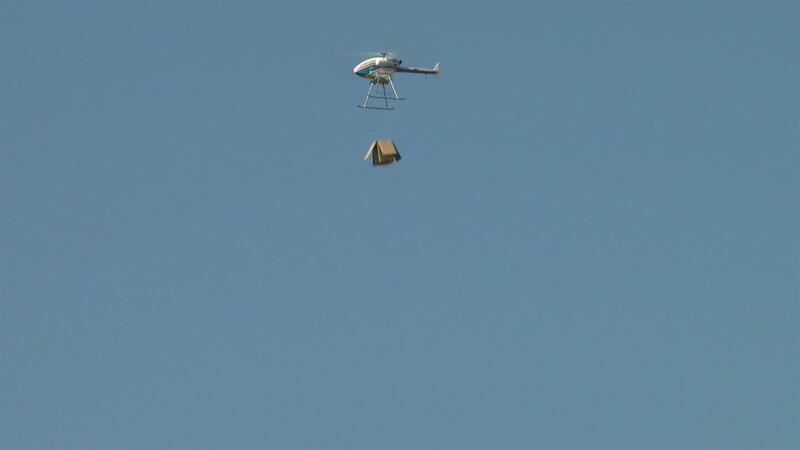 With this combination of helicopter and box, payloads of 10 to 20 kilograms can be delivered. This payload capacity is currently unmatched by comparable unmanned technologies such as multicopters. During initial flight tests in Germany, DLR researchers were able to show that the planned application is technically feasible. Together, DLR, WFP and Wings for Aid have identified possible areas of application and developed a mission scenario to test simulated responses to emergency situations and evaluate the technology in realistic applications. In the next step, these realistic deployment scenarios will be conducted in the Dominican Republic. "We want to use the helicopter to simulate the delivery of emergency supplies in a realistic environment. By doing so, we will be able to assess the combination of unmanned helicopter and disposable cardboard boxes, and evaluate how this technology can improve the humanitarian logistics chain," says Dauer. For the safety assessment of these missions, a very recent method called Specific Operation Risk Assessment (SORA) is used to ensure the safe operation of the UAS. The project is funded by, among others, theWFP Innovation Accelerator in Munich. The flight tests in the Dominican Republic will take place from the end of June 2018.